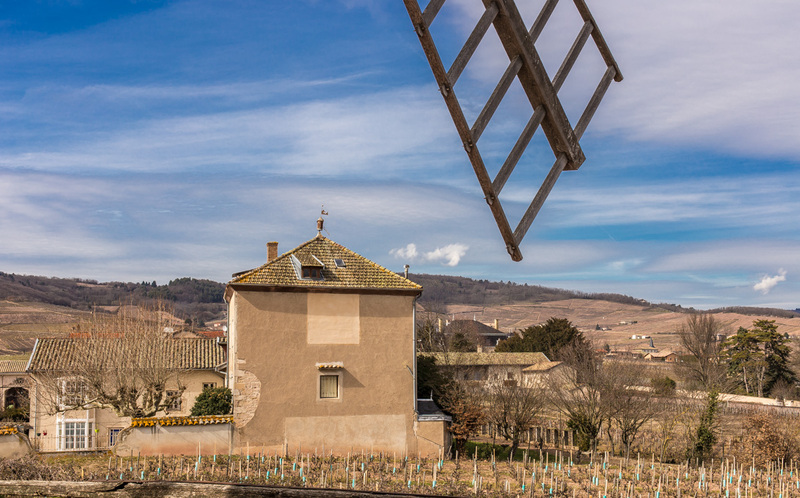 This is a view roughly toward the west from the foot of the moulin à vent (windmill) in the vineyards of Beaujolais. You can see that I artfully (!) captured the end of one of the windmill's sails in the photo. 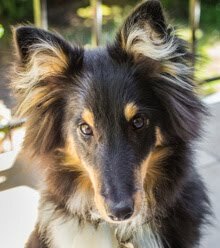 Otherwise, the photo is without much interest. What is that on top of the roof? That is, until you look very closely at the tip of the roof on the house in the center of the image. I enlarged it below to show you what I mean. 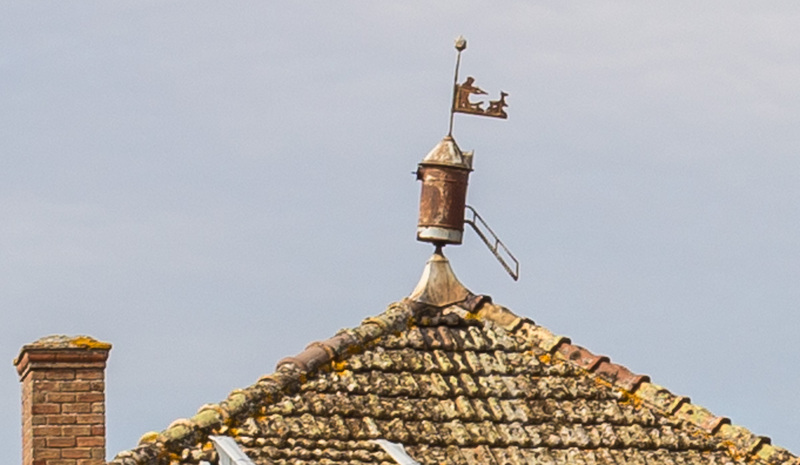 The little weather vane on the point of the roof is a miniature of the windmill itself. On top of that, the wind vane looks like a hunter aiming his gun at something, perhaps a deer. It's a weather vane in the shape of the neighboring windmill! I'm nearly done with my photos from this little four-day trip. On the home front, a sneaky leak recently developed in the cold water supply pipe under the kitchen sink. The leaking water was running down the pipe inside a wall and shorted out an electrical outlet on the floor below which immediately tripped the master breaker, cutting off our electricity the other night. Before knowing about the leak, I isolated the breaker that was the problem (there's only one outlet on that circuit) and was able to restore power to the rest of the house. Ken later figured out that the outlet might have shorted out because of water (it's been raining a lot) and indeed it had -- the wall above the outlet was damp and the floor under the outlet was wet. But it wasn't rain. We traced the dampness back to the kitchen sink upstairs and discovered the leak. The plumber came over on Tuesday and fixed the pipe. Now we're letting the outlet dry out for a few days before plugging anything back into it. The first shot is artful and the close-up is wonderful. A great weather vane. Yikes about the leak. I'm glad it didn't cause worse damage. It's always something, non? Glad you have power. What Evelyn said. We have a new bathroom faucet because of a sneaky leak also--took me weeks to figure out the source of a very occasional drip.